The fact that there are ATM machines available at a tourist resort like Boracay, is not so obvious in the Philippines. There are plenty of other tourist beaches in the country that do not have any of them. However, there is nothing to worry about money on Boracay Island. 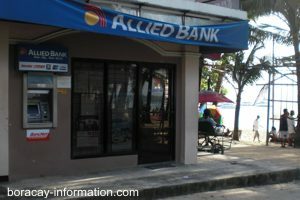 Some ATM's are available right along the beach front and even more along the only main road. You will also find some at Boracay Airport in Caticlan and at the Jetty Terminal in Caticlan. Please note that all ATM in the Philippines are limited to 5.000 or 10.000 Peso per transaction. If you try to get more than that, you will get an error message that might not exactly tell you the exact reason. Just try again with an smaller amount. Some ATM's will also deduct another "Service Charge" of 200 or 250 Peso on foreign credit cards. 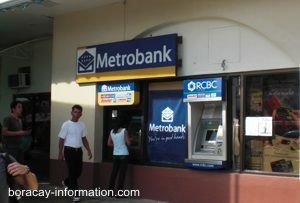 ATM's in the Philippines work best with Master & VISA Cards, or ordinary ATM Cards that have either the maestro or cirrus logo on it. There are also plenty of money changers along the beach and along the main road, where you may change your foreign currencies into Philippine Pesos. Traveler Cheques are not so welcome in the Philippines. There are usually only a few money changers or travel offices in the country who will change them into cash. Banks always making a big story with copies of the cheque, the passport and more, if somebody tries to exchange Traveler Cheques. Some banks may not even accept them at all. As a result, it's most convenient to bring either cash or your credit card along for a holiday on Boracay.